Este post fue patrocinado por el desodorante Dove® ClearTone™ Deodorant - diseñado para visiblemente reducir las manchas rojas y oscuras y dejar un tono uniforme. Me encanta el clima de verano. Puedo usar todas mis camisetas sin mangas, sundresses y faldas cortas. En Ohio el clima puede cambiar rápidamente por lo que mi piel tiene que lucir siempre impecable. A big part of my skin prep has always included Dove. Mi madre wouldn't buy anything else because her skin is so sensitive. When you grow up using one product line it's usually automatic to continue as an adult. I begin my day using Dove bar soap. My skin is so dry I need all the moisture I can find. After getting out of the shower while my skin is still damp, I use Dove's Intensive Nourishing Lotion to seal in the moisture from the warm shower. If you have dry skin it's important to take a warm bath or shower. Hot water can actually cause your skin to dry out even more! No bueno. After I get out of the bathroom I put on my deodorant. Dove is one of the few companies that makes a deodorant that does not get white marks all over your shirt. Grr, I hate that! Especially since I don't usually notice it until I'm walking into work. Ever try to get deodorant off of a black shirt? It doesn't work. Ever. Estoy saliendo ahora, así que es súper importante que mi piel se ve suave y agradable al tacto. Me encanta dar y recibir un montón de abrazos. Nadie quiere abrazar a alguien que tiene la piel áspera. 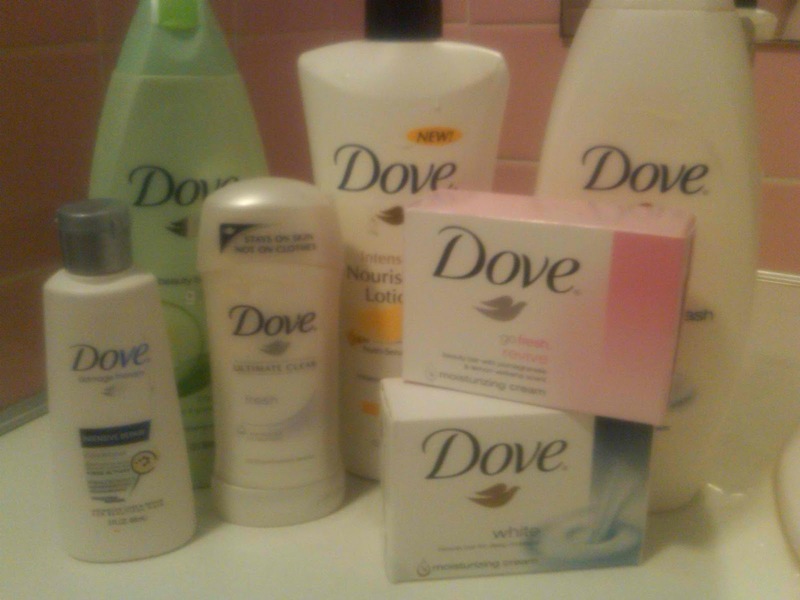 Los productos Dove me ayude a lucir bien. ¿Por qué me ha consumido alguna vez alguna otra cosa? I was compensated for this post by the Clever Girls Collective.com. All the opinions expressed here are my own. Claro ;). A little of this and that.